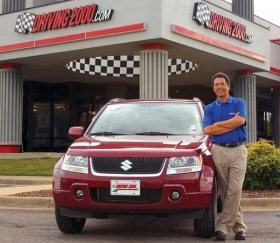 When Gary Linam, shown in this 2006 photo, closed his two big Alabama Suzuki stores this year, owners had to drive 80 miles to Nashville for warranty and service work. Customers orphaned by the closure of what was the largest U.S. Suzuki dealership now can go to a nearby Hyundai store for Suzuki factory warranty and service work. American Suzuki Motor Corp. awarded a Suzuki service-only franchise to Huntsville, Ala., dealer Trey Bentley. Last week Bentley began offering warranty and other service work to owners of Suzuki vehicles at his dealership, Bentley Hyundai. Bentley said he applied several weeks ago with American Suzuki to become a service-only dealership after learning that the company was looking for an established store to play that role. "We have the space to handle it, and we didn't have to add many support people," said Bentley, whose outlet has a 12-bay service department. In March, owners of Suzuki vehicles still covered by new-car warranties sued former Suzuki of Huntsville owner Gary Linam and American Suzuki. The owners said they were denied an opportunity to obtain warranty service for their vehicles when Linam closed his two Suzuki dealerships this year. That meant that the closest Suzuki dealership is about 80 miles away near Nashville. In 2006, Linam's Suzuki of Huntsville was the automaker's top U.S. sales outlet, and his Suzuki store in Sheffield, Ala., was the third-largest. Linam closed both stores after losing his inventory financing. Suzuki spokesman Jeff Holland said Suzuki has had service-only points before, but he could not provide information about how many or where they were. He added: "We have established these sorts of relationships to help out our customers."